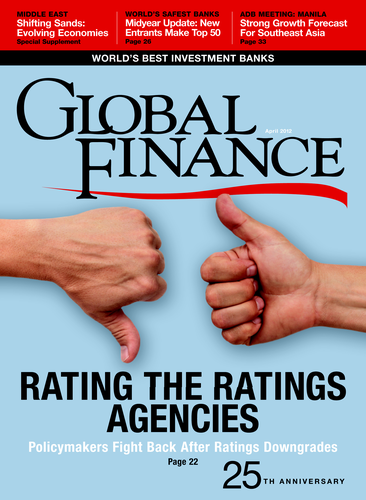 This month we look at ratings and ratings agencies in two different, and only apparently contrasting, ways. On the one hand our cover story discusses the search for a new model for agencies, and the many ideas and projects that are being bandied about. On the other hand we have a midyear update of our annual ranking of the World’s Safest Banks—which is based on ratings assigned by the three main rating agencies. For us there is no contradiction: The ratings are still one of the most practical tools to judge the credit-worthiness of a bank or corporation. That is not to deny the clear problems with certain functions of the world’s largest ratings agencies—in particular when it comes to sovereign ratings and structured finance. The timeliness and the impact of ratings are being debated worldwide. And it is no secret that the debate on sovereign ratings has developed a clear political subtext. 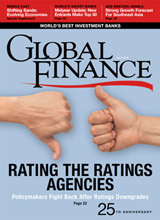 Policymakers in various jurisdictions have, of late, taken a close look at the methodology of the ratings agencies. Right now there is no model or set of regulations that have taken center stage. But regardless of their faults it is clear that the existing ratings are better than chaos or the absence of any external and independent opinion on corporate or sovereign issuers. Even when, as with the recent dramatic developments in Greece, sovereign ratings are at odds with public perception of risk and also with the official line of parties in power. In this issue we also include two roundtables recently organized by our magazine and showcasing two distinct Asian economies—the Philippines and Taiwan—as seen through the eyes of local policymakers and leaders of the financial services and corporate sectors. Both countries have shown remarkable economic growth in the past few years, and both are feeling the effects of the slowdown in North America and the recession in Europe in very different ways.